Published: Nov. 1, 2018 at 06:15 p.m. Updated: Nov. 1, 2018 at 06:38 p.m.
Want to see the numbers behind the numbers? Nick Shook dives into a fresh batch of Next Gen Stats and identifies figures that will help shape Week 9. The pairing of Cam Newton and veteran offensive coordinator Norv Turner is producing a wonderful Panthers offense in 2018. 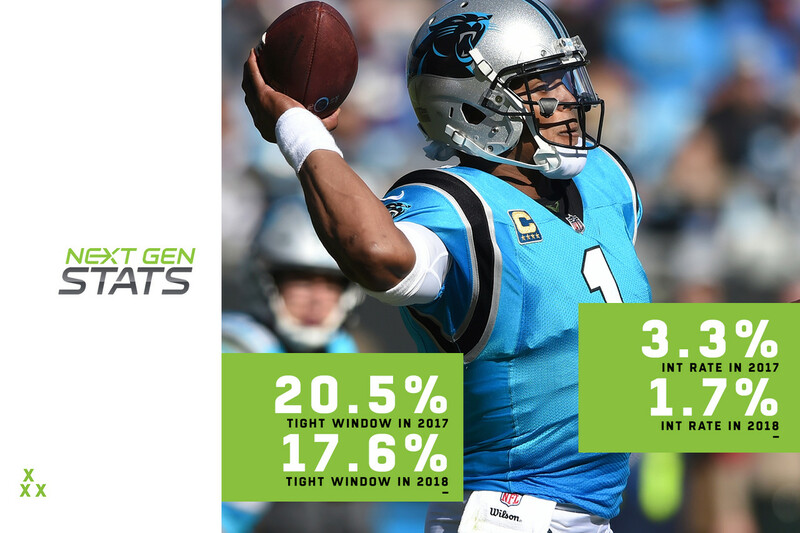 The proof is in the Next Gen Stats for Newton, who is performing well above his previously established career marks in completion percentage. Part of the reason has to do with whom Newton is targeting, and when. Newton is attempting open-window throws more often than tight-window throws for the first time in the last three years, targeting open receivers on 23.1 percent of passes as opposed to 17.6 percent on tight-window throws. Directly related to this is the distance of Newton's attempts, as the quarterback is throwing shorter passes to greater success (7.5 air yards per attempt in 2018 as opposed to 8.2 in 2017 and 11.0 in 2016, which was the highest mark among qualifying quarterbacks that year). As a result, Newton's interception rate has dropped by nearly 50 percent, from an interception on 3.3 percent of passes in 2017 to 1.7 percent of passes in 2018. Ryan Fitzpatrick finds himself back in the starting lineup in Week 9 after Jameis Winston's struggles necessitated a change in Tampa Bay. The Next Gen Stats show why it's an obvious decision to go with the wily veteran over the younger quarterback. Fitzpatrick's passer rating is the best in the NFL, but the deeper dive reveals he's better by nearly every Next Gen Stats passing metric. Fitzpatrick's rating is better than Winston's on deep passes (147.7 vs. 59.3), attempts under pressure (116.0 vs. 96.6) and tight-window throws (85.3 vs. 43.0). When considering these numbers and the film, it's no wonder coach Dirk Koetter turned to the wand for more Fitzmagic. Patrick Mahomes has taken the league by storm while Baker Mayfield has given Cleveland Browns fans hope for the future. They meet in Week 9 in Cleveland. They have similar expected completion percentages (63.6 and 62.5), but the numbers differ from there, with Mahomes owning a clear advantage. The two stray from each other on quick throws, with Mahomes performing better than Mayfield in completion percentage (82.4 for Mahomes, 70.9 for Mayfield), yards per attempt (9.6 vs. 5.7), touchdown-to-interception ratio (12-0 vs. 4-2) and passer rating (137.1, 89.6). The aforementioned numbers for Mahomes are the best in the league among 34 qualified passers. Todd Gurley's ride as the league's leading rusher has shown no signs of slowing through eight weeks. As part of the league's best team (in terms of record), Gurley has made the most of his opportunities. But Next Gen Stats reveal he's playing on a field tilted to make his jaunts more leisurely. Case in point: Gurley, who has faced the most favorable fronts in the league on average, has seen his opponents load the box even less as of late. His rate of loaded boxes on rushing attempts has dropped below 10 percent for the first time this season, with the metric hitting 9.5 percent through eight games. He's also facing less than seven defenders in the box more often than any other runner in the NFL (minimum 80 carries) at a rate of 65.5 percent. Sean McVay's passing game has opponents so worried, they're sacrificing run defenders at the highest rate in the league. The result: a league-leading 800 yards and 11 touchdowns for Gurley. Denver's team has shown flashes of potential, but seems to run into traps on every other step. For each stop the Broncos' defense earns and every Case Keenum completion, there's a trip or two and an eventual fall, leading to Denver's 3-5 record. A deeper dive into Denver's offensive line reveals what can be seen on the film: The Broncos have a hard time blocking for Keenum. In the last six weeks, things have gotten worse for Denver up front, with the offensive line allowing a pressure rate that is six percentage points higher (from 23.7 to 29.7 percent of dropbacks) than it was in the first two weeks of the season. Pressures per game have also jumped from nine in Weeks 1-2 to 11.67 in Weeks 3-8. As a result, Denver has allowed 20 sacks in the last six weeks (as opposed to two in Weeks 1-2) for an increase in sack rate from 2.6 percent to 8.5 percent. It's no coincidence that the Broncos have won only one of their last six games. Chargers headed for a power outage? As the Chargers continue their rise to prominence in Southern California, one of their hallmarks has been Philip Rivers' ability to find success with long passes. Rivers ranks fifth in the NFL with a 127.1 passer rating on deep passes (20-plus air yards) and has been pressured on just 16 percent of such attempts, third-lowest in the NFL among 34 qualifying quarterbacks. Tedric Thompson and Seattle bring one of the league's top deep-pass defenses to this Week 9 meeting, allowing only one touchdown on deep passes all season (best in the NFL). They've also allowed just five completions (tied for second-best in the NFL), and a paltry passer rating of 61.9 (third in the NFL) on such attempts. Might Rivers see a setback in the deep-passing game in the Pacific Northwest? Drew Brees and Jared Goff are leading two of the NFL's best offenses, but they're finding air-based success in vastly different ways. Goff only releases a quick throw (2.5 seconds or less) on 24.9 percent of pass attempts, the lowest in the league by a significant margin, which also serves as a testament to the Rams' offensive line, which is allowing a pressure rate of just 22.2 percent (tied for seventh-lowest). Meanwhile, Brees is getting the ball out at breakneck speed, with 51 percent of his attempts coming in 2.5 seconds or less. In an example of how two styles can achieve success, each are among the NFL's best on quick throws, with Brees posting a 117.7 passer rating (third in NFL) and Goff recording a 133.6 passer rating (second in NFL). It could be the difference when the two teams meet on Sunday, as the Rams are allowing the second-lowest passer rating (80.2) and the Saints are allowing the third-highest rating (119.4) on such quick throws.